Here in Italy Republic Day is celebrated on the 2nd of June each year. It commemorates the institutional referendum in 1946 when the Italian people were called to the polls in order to decide on the type of government they wanted following the second world war and the fall of fascism. With 12,717,923 votes for a republic and 10,719,284 for the monarchy, the male descendants of the House of Savoy were sent into exile. To commemorate this event a grand military parade is held in central Rome and presided over by the President of the Italian Republic in his role as supreme commander of the armed forces. The prime minister, formally known as the President of the council of ministers, attends along with other high officers of state. There are important celebrations in all the Italian embassies and foreign heads of states are invited. Even though the main parade is in Rome, many Italian cities celebrate the day as well. 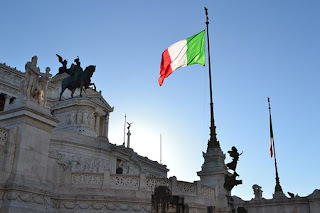 Prior to the foundation of the Republic, the Italian national day was celebrated on the first Sunday in June, the anniversary of the granting of the 'Statuto Albertino'. From 1977 to 1999, for economic reasons, this was the day when the foundation of the republic was celebrated and it was only in 2000 that the 2nd June was officially instated.